A cultivar of Prunus avium L. ‘Fruit pretty large, growing, for the most part, singly, heart-shaped, a little flattened at the apex, compressed on one side, with a slight suture. Stalk one inch and a half long, slender. Skin of a dark purple approaching to black when fully ripe. Flesh pale red, rather firm, but mellow, with a rich well flavoured Juice. Ripe the end of July or beginning of August.’ [George Lindley – Orchard Guide p.149/1831]. A fairly vigorous tree, spreading and drooping. A mid-season cherry of fair quality which rarely cracks. [Grubb, Don]. Figured in Pomona Brittanica PB pl.VII/1812. An old variety, I have no information on its origins. 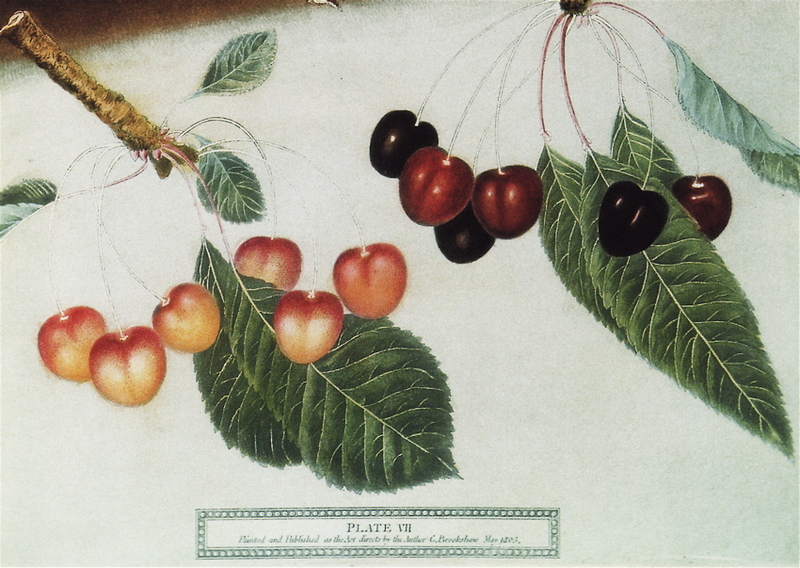 Listed in the 1850 and 1857 catalogues only [Cherry no.7/1850]. There are a number of Black Heart cherries, usually with a specific prefix, e.g. ‘Fraser’s Black Heart’. Prunus avium ‘Black Heart’ | PB pl.VII/1812. The varieties 'White Heart' and 'Black Heart' are shown.